This challenge is proving to be a real challenge. I've written and deleted pages of text trying to figure out how to address this topic. I'm basically trying to reflect on where I am today. This reflection is prompted by the death of a friend here in Fairbanks. He was about a year younger than I, looked to be in much better shape but had a heart attack. Like I mentioned in challenge #15 "What are you thankful for today? ", I'm thankful that I was able to retire. Several close friends hadn't made it that far. In the past, I thought that I could do just about anything if I was willing to put my mind to it. I don't really believe that anymore. But I'm not sure that I'm ready to just coast either. I know that I'm not going to be climbing Denali or riding a bicycle or motorcycle around the world. Nor sailing around the world. All of those things I had considered doing in the now distant past. I'd like to make some more motorcycle trips one of these days but I don't feel that "I have to" as do some of my friends. Right now, I'm really looking forward to our road trip this summer. I'm thinking of taking a bicycle with me this summer and trying to do some riding. For the last couple of days, I turned on the inverter and plugged in the Ubiquity radio and its wireless access point. I've been connecting to that access point almost exclusively just to verify functionality. This modest load resulted in a 5% consumption of the battery bank by the next morning. Even with the less than optimal weather (hazy sunshine) and short days, the batteries would be up to 100% by early afternoon. This is with only one 130 watt panel. I was planning on initially installing 4x100 watt panels on the RV and see how that works for us. The capacity of the Tristar TS-45 PWM charge controller is seven or eight of the 100 watt panels that I am planning on using depending of if you are using the short circuit current (Isc) or the optimum operating current (Imp) in the calculation. I picked up the parts to make a combiner box. This is essentially a weatherproof junction box that sits on the roof. In my case, the plastic PVC junction box with an "O" ring on the lid came from Lowes. I will be running 4 awg wire from the charge controller to this box through a hole in the bottom that goes through the roof. The short bus bars have connections for 2 large wires and 5 smaller ones. Two of these bus bars will go into the box. 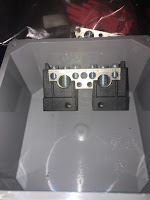 10 awg wire will be used to connect pairs of panels (in parallel) into the combiner box. 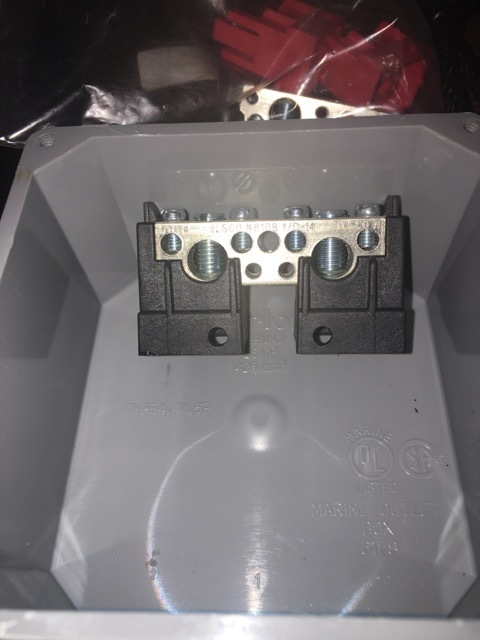 The plastic mounts for the bus bars will be screwed into the bottom of the junction box and the bus bars snap into place. I'm still trying to decide if I will put install fuses inside this box for each pair of panels. Plus I have one more bus bar that will be fastened to the bottom of the box for the ground wires. Grounding is required for home solar panel installations as the panel frame is usually one of the highest things on a home. It is grounded through a rod pounded into the ground. Obviously a RV does not have that sort of ground setup. The best may be the metal jacks and stabilizers touching the ground. If you look on the Internet at RV solar installations, not all of them have ground wires. I'm thinking that it's probably a good idea. This challenge is proving to be a real challenge. I've written and deleted pages of text trying to figure out how to address this topic. I'm basically trying to reflect on where I am today. This reflection is prompted by the death of a friend here in Fairbanks. Nothing has changed for you. Your still in Fairbanks and it's cold as hell. As you get get older a lot of your friends will be dropping around you. I'm 73 and relish in that fact, because a lot of folks don't make it that far. And remember none of us get out of here alive. Don't ever quit making plans for your self, I'm going to Stewart/ Hyder this summer with the Raven, I went to Dawson for the first time last summer. But if you have any doubts about see a cardiologist and get a nuclear stress test. I've got A-Fib so I'm on blood thinners 24-7 but all my veins around the heart are clear. Yes, still in Fairbanks but it's warming up. It got all the way up to +6°F today. The trip to Stewart/Hyder is pretty nice. I took 3 days from Whitehorse to Stewart and was taking it pretty easy. I had pretty nice weather except for some rain south of Dease Lake. When I was there I was concerned about the Ural driveline so I didn't venture to the glacier from the campground but my neighbors did. 2 up on their R1200GS and had some great pictures. Many RV solar installers don't ground the solar panel frames to anything and that seems to be a bad idea. And the metal jacks at the front are pretty solidly placed on the ground as there is a couple thousand pounds pushing them into the ground. I was planning on running a large ground wire from the roof to the RV frame to ground the aluminum frames of the solar panels but wasn't sure what gauge wire to use. Nothing like a friend passing to make you reflect on what's important. I'm sorry for your loss. I am interested in your solar journey. We have thought about but not done anything for our RV yet. So sorry to hear about your friend. It really does put things into perspective. Unfortunately, I find too quickly that I have fallen out and into my old habits. I hope that doesn't happen for you. You gonna make it to GA on this summer trip? ?